We're getting houses - but I live on my ship! The video obviously doesn't show much. We see what is assumed to be a player-owned apartment on what seems to be Coruscant. There is some furniture and a mailbox. The thing standing at the left side of the room may or may not be a cargo hold. And there's a droid, of which it is unclear whether it is the jedi knight companion or a 'house droid'. The video is more a teaser than anything. Still, I think it's pretty cool that they're working on this, and I know that many people been hoping for housing for a long time. Myself, I've always felt that my ship was in a way my own 'house', although it's a shame there isn't much to customize there apart from adding the useful stuff like training dummies and cargo holds. What will SWTOR housing add here? A house can be so much fun, but if it's situated on some far backwater area you can't easily reach, I'll forget about it and rarely visit it. It should at least have a quick travel. It would be great if a house would give you extra cargo space, preferably shared between characters. It could be, like, a legacy house. That way it would make sense lore-wise as well. It would be awesome to collect items won in battles (raids, flashpoints) or found in the open world that remind you of adventures experienced and place them in your house. I'm sure the developers can come up with some crazy cool ideas of things to put there. Especially things you can use ('click') and that do something are my favourite. I once saw a really cute video made by a LotRO player, showing his housing trophies and 'flashbacks' to the moment he'd acquired them. I'm so annoyed that I can't find it back to show it to you! I love crafting recipes for outfits, even though they took a big hit with the introduction of the cartel market. It still would be cool to be able to craft nice stuff for your house. Like actual good-looking stuff, not a hobo version for people who can't afford stuff from the cartel market. 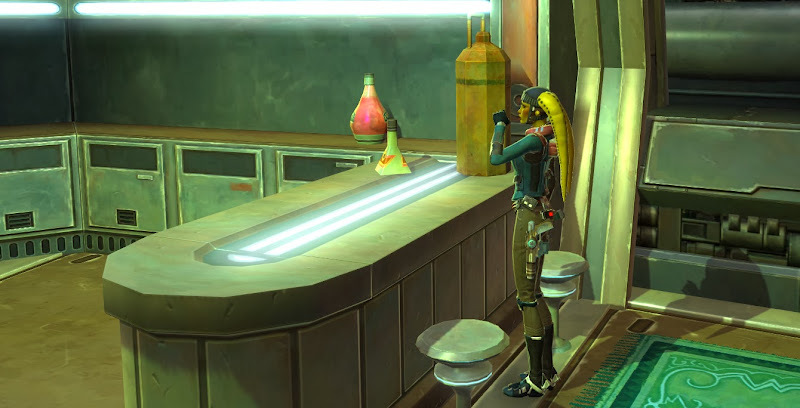 If SWTOR houses will have a kitchen and a privy, I'll salute the developers. I'm not counting on it, though. Oh and Star Wars houses should totally be called apartments. I'm getting the TOR feeling already! I have to spend more time than I'd like into trying to get money in Star Wars. If it's going to be very expensive to pay upkeep, it will have to be very good for me to bother with it. The developers no doubt have ideas about cartel market housing items. I just hope it's not going to be a cartel market exclusive housing party. That would greatly take away my interest. This is a tricky/personal one. I've always felt that the personal houses in LotRO had too much space: loads of space and just sometimes an item here or there. I'd like my house to be full of stuff, looking cozy like my real house would look like, not like a random page taken from a design magazine. Will I buy a house? I generally like owning a house and putting my stuff there, but we don't know anything about housing in Star Wars yet. In LotRO, I do own one, which I mostly use for nostalgia reasons and to get dyes from the shared vault. I gave Tiger access to the vault, since he's a digital hobo. I don't know if he'll want an apartment in Star Wars or not. Whether I'll get one myself will mostly depend on the factors described above. I have no idea if we're getting a legacy house or a character house, both are possible! In LotRO you were allowed one house per account, I think it had something to do with limitations to space for data they set. If everyone would make a house for every alt they had that would be, well, a *lot* of houses. No idea how stuff's with that these days. I wouldn't dismiss a legacy house so easily, though! But I agree with you that both possibilities have their advantages. You're right, they should have done something with the ships from the very beginning. But that "ship" has long sailed, and they've locked in their technology. At this stage though, I can't imagine it being anything other than the money sink/cash shop scenario you dread.